Women Across Frontiers: What made you start doing what you are doing today? 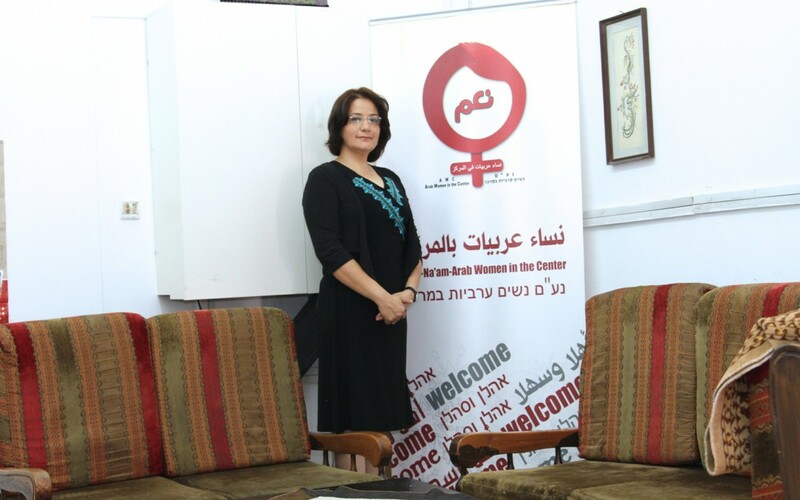 Samah: The reason I created the Arab Women in the Center organization six years ago was the murder of six Arab women in the town of Lod in 2007. They where murdered simply because they were women. While there are many women’s organizations in Israel who do great work researching, writing and learning about ‘honor killings,’ no organization existed that could provide support to the families and other Arab women in the area. I noticed that the murder of one woman put all women in the entire area in a state of fear for a long time. And fear is the greatest tool to control people. I was frustrated with the authorities until one day a journalist told me that instead of being frustrated that no one was doing anything, I should create myself what I thought was needed! And so I did. I dreamt of a place that would provide women with everything they need, from financial consulting to legal consulting. And this is what we do now. My second activity is writing about gender issues for the magazine ‘Local Conversation.’ I remember a professor who told me that my level of writing was not good enough and he rejected my thesis saying I lacked writing skills. A year ago, I finished the Mandel Fellowship at the Mandel Institute of Leadership. That program gave me a huge drive to write. They believed in me, they gave me a platform to practice, and to make mistakes. I am only at the beginning stage of my writing path but I enjoy it a lot and ‘Local Conversation’ gives me a good platform to write and explore gender issues. WAF: What motivates you to do what you do on a daily basis? Samah: I get a lot of energy from seeing women at the Center succeed. I’ve never created a huge revolution but every girl who succeeds in overcoming a barrier gives me energy to do more. Many times I operate from a very intuitive place that may not be “professional” or “by the book.” Often, I do ‘non-conservative’ things, such as loaning school tuition to a girl who couldn’t afford it otherwise. These girls end up not just paying me back the money but also paying me back with love, appreciation and a commitment to succeed. Many young women approach us with a dream to study, others come from houses where there are being verbally or physically abused. We help them, and these success stories give me fuel for years. WAF: What do you consider your biggest struggle or your biggest challenge? Samah: My biggest challenge is dealing with my national identity as a Palestinian Israeli citizen, as a minority among a Jewish majority that is becoming racist, violent and lives in a euphoria typical of majorities in other countries. This behavior has also become part of the government’s policy and it is hurting my rights as a citizen. My feminist struggle within the Arab community is harder because of my political struggle for my rights as a minority. I think women’s rights and citizen’s rights should be unified. In my personal life, my biggest challenge are my husband and my three sons who grow up in a patriarchal Arab society who gives them more rights then me simply because I am a woman. WAF: What is your biggest achievement or your most transformative moment? Samah: Mine was one day, when a woman with two children entered my office. I didn’t recognize her, so she told me that her name was Amal and that I saved her life ten years ago. Amal was an excellent student, but at the age of 16, her family wanted her to leave school and get married. She became depressed because her dream was to finish school and to go to university. I remember I was trying to convince her dad, who wanted her to get married, start wearing a hijab and raise children, to let her finish school and go to university. It was difficult but eventually he agreed to let her finish high school and to marry after graduation. He also made her husband promise to help her go to university. So she started wearing the hijab but she finished her master’s degree in education and started to volunteer with us. Her journey took her longer than others but she didn’t give up. Amal’s persistence was a transformative moment for me. WAF: What is your ultimate goal or your biggest dream? Samah: My dream is to see the Palestinian people free from occupation, to see them building a country and a democratic state without oppression and violence. My dream is to celebrate a decade without any women being murdered because she is a woman. I wish that every girl in this world can live a life without violence, sexual or other abuses, and any other sort of discrimination. WAF: What is your favorite quote? Sameh: One of my lecturers at the Mandel institute once told me, “Your feminist war is the longest independence war in the history of humanity, a war in which half of humanity is asking freedom from the other half. It takes time.” I believe I am fighting in the most human, and gentle army in the world and I will keep dreaming and fighting.